[170 Pages report] The bread improvers market was valued at USD 3.02 billion in 2016 and is projected to grow at a CAGR of 5.2% from 2017, to reach a value of USD 4.08 billion by 2022. The basic objective of the report is to define, segment, and project the global market size of bread improvers on the basis of type, application, ingredient, form, and region. It also helps to understand the structure of the bread improver market by identifying various segments. The other objectives include analyzing the opportunities in the market for stakeholders, providing the competitive landscape of the market trends, and projecting the size of the bread improvers market and its submarkets in terms of value (USD Million) and volume (KT). This research study involved the extensive use of secondary sources–which included directories and databases—such as Hoovers, Forbes, Bloomberg Businessweek, and Factiva for identifying and collecting information useful for a technical, market-oriented, and commercial study of the bread improver market. The primary sources include industry experts from the core and related industries and preferred suppliers, dealers, manufacturers, alliances, standards & certification organizations from companies; and organizations related to all the segments of this industry’s value chain. 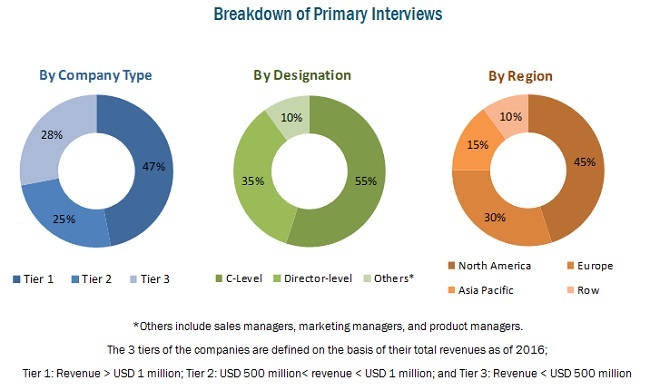 In-depth interviews were conducted with various primary respondents, such as key industry participants, subject matter experts, C-level executives of key market players, and industry consultants to obtain and verify critical qualitative and quantitative information as well as to assess future prospects. The following figure depicts the market research methodology applied in drafting this report on the bread improvers market. Key participants in the bread improver market are the bread improver manufacturers, suppliers, and regulatory bodies. The key players that are profiled in the report include Archer Daniels Midland Company (US), Associated British Foods plc (US), Ireks GmbH (Germany), Oriental Yeast Co., Ltd. (Japan), Fazer group (Finland), Corbion N.V. (Netherlands), Nutrex N.V. (Belgium), Group Soufflet (France), Puratos Group (Belgium), Lallemand Inc. (Canada), Pak Group (US), InVivo (France), Bakels Worldwide, (Switzerland), Lesaffre (France), and John Watson-Inc (US). With the given market data, MarketsandMarkets offers customizations according to a company’s specific needs. 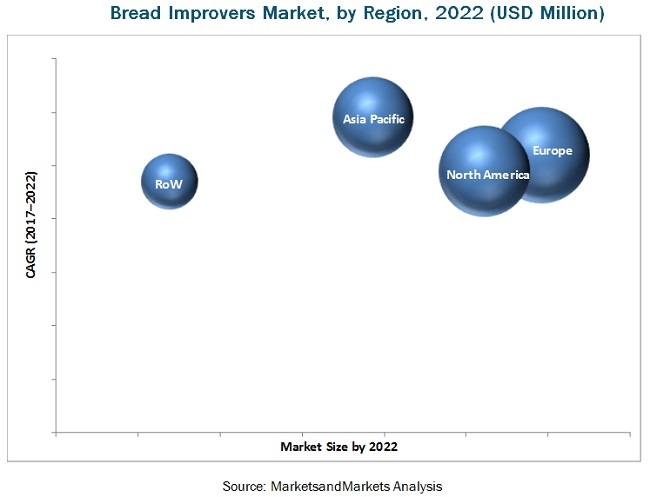 The bread improvers market was valued at USD 3.01 billion in 2016 and is projected to grow at a CAGR of 5.2% from 2017, to reach a value of 4.08 billion by 2022. The growing consumption of bread and related bakery products, innovative bread product offerings by bakery product manufacturers, and rising demand for convenience food products are some of the key trends influencing the growth of the bread improvers market. Based on type, the market has been segmented into inorganic bread improvers and organic bread improvers. The inorganic bread improvers segment dominated the market in 2016. The ingredients of inorganic bread improvers are cheaper as compared to the organic bread improvers; they are mainly used in the production of industrial bread. In addition, they are commonly used to improve the quality of dough, such as enhanced volume, stability, and softness. In terms of ingredients, the emulsifiers segment dominated the market in 2016. Emulsifiers are substances that stabilize an emulsion; they are mainly used in the bakery industry to reduce the fat content in bakery products as their functions also include dough conditioning, shelf life extension, and crumb softening. Monoglycerides, diglycerides, lecithin, and DATEM are some of the common emulsifiers used in baking processes. It is projected to find increased application in bread making, particularly in developed regions such as Europe. As the bakery industry in Europe is the largest in the world, it reflects positively on the overall growth of the bread improvers market. In the form segmentation, the powder segment accounted for the largest share of the global bread improvers market in 2016. Bread improvers in the powdered form are mainly used by manufacturers as it is easier to use as a raw material in baking processes as compared to liquid and granular forms; therefore, powdered bread improvers account for the largest market share. The powdered form finds applications in various bakery products such as bread, viennoiseries, and cakes. In terms of application, the bread segment dominated the market in 2016. The rising number of fast-food chains and convenience food stores across the globe has increased the consumption of other bread products such as buns and rolls. This, in turn, is driving the demand for bread improvers in the market. These products are mainly available in supermarkets, hypermarkets, and mini-marts. In addition, as the artisan bakery is popular in various European countries such as France, Turkey, and Italy, these bakers are contributing to the demand for bread improvers in bread & rolls in the region. The consumers in Europe prefer bread and bread products that are made using natural bakery ingredients offered in innovative shapes and new flavors. Asia Pacific is projected to be the fastest-growing market for bread improvers during the forecast period. The increasing urbanization and growing demand for convenience food are projected to drive the market for bread improvers. Due to the increasing demand for convenience food products in this region, the growth of the market is projected to grow substantially. In addition, increasing demand for bread and rolls in this region due to Westernized food habits is projected to surpass the market in developed regions such as Europe and North America. There is also an increase in the consumption of on-the-go breakfast meals due to growing urbanization, hectic lifestyles, and high disposable incomes among consumers. This trend is projected to fuel the growth of bread improvers in the region as an increasing quantity of bread and bread products are projected to be consumed. This region also offers scope for product innovation in the bakery industry as consumers have various tastes and preferences and look for variety in rolls and bread. This has offered manufacturers the scope of innovation to expand their product portfolio. Such market potential is projected to impact the bread improvers market during the forecast period positively. The challenges faced by the pet bread improver manufacturers include critical formulation and low consumer awareness. Such challenges are projected to hinder the growth of the bread improvers market over the coming years. Key participants in the bread improver market are the bread improver manufacturers, suppliers, and regulatory bodies. The key players that are profiled in the report include Archer Daniels Midland Company (US), Associated British Foods plc (US), Ireks GmbH (Germany), Oriental Yeast Co., Ltd. (Japan), Fazer group (Finland), Corbion N.V. (Netherlands), Nutrex N.V. (Belgium), Group Soufflet (France), Puratos Group (Belgium), Lallemand Inc. (Canada) Pak Group (US), InVivo (France), Bakels Worldwide, (Switzerland), Lesaffre (France), and John Watson-Inc (US). 12.5 Oriental Yeast Co., Ltd.